In the different periods of the church, various doctrines have occupied the minds of theologians and Bible expositors. In the third and fourth centuries of our Christian era, the Person and Work of Christ were warmly debated. In the Reformation period, it was justification by faith alone. Today, one of the prime issues is the origin, the nature, and the mission of the church. 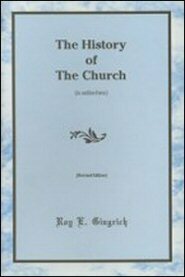 Because of this awakened interest in the church on the part of Christians in general and of Christian youth in particular, Dr. Roy Gingrich’s expanded outline on “The History of the Church” is assured of a welcome from every earnest Christians. This handy compendium of the history of the church is somewhat unique. It offers a new approach to this vital subject. After a brief general introduction, the author divides church history into nine periods. Excepting the first one, each of these periods is treated succinctly yet thoroughly under five headings: (1) The Expansion of the Church; (2) The Government of the Church; (3) The Doctrine of the Church; (4) The Worship of the Church; and (5) The Life of the Church. Dr. Gingrich in this outline has described the ebb and the flow, the men and the issues, of church history in such a way that everyone can enjoy them and profit from them. Read this outline with anticipation.